FIRST ("For Inspiration and Recognition of Science and Technology") is a non-for-profit organization created in 1989 with the mission of inspiring the nation’s youth’s interest and participation in science and technology. This is achieved by groundbreaking programs that motivate K-12 students to reach beyond their STEM academic studies in the classroom, giving them opportunities to use hands-on experience in working with a team to overcome engineering and programming problems involved in robotics, fund and promote their own products, and gain experience working with professionals in both companies and universities in addition to their school’s teachers. The FIRST Robotics Competition (FRC) is an international high school robotics competition organized by FIRST. 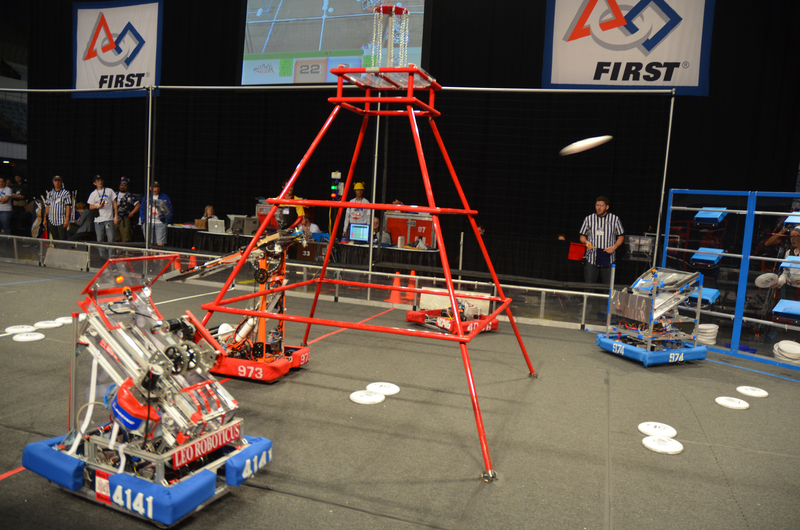 Each year, teams of high school students compete to build robots weighing up to 120 pounds (54 kg), that can play in a game, which requires robots to complete tasks such as scoring balls into goals, frisbees into goals, inner tubes onto racks, hanging on bars, balancing robots on balance beams, etc. The game changes every year, keeping the excitement fresh and giving each team a more level playing field. While teams are given a standard set of parts, they are also allowed a budget and encouraged to buy or make specialized parts as long as they conform to FIRST rules. Game details are revealed at the beginning of January and the teams are given six weeks to construct a competitive robot, that can operate autonomously as well as when guided by wireless controls, to accomplish the game's tasks.